A series of tornadoes swept through northwest South Dakota on Monday, causing some damage but no injuries, according to police. A U.S. official said Monday the latest video from fugitive cleric Anwar al-Awlaki "is just one more indication that he is an avowed terrorist who espouses murder and the killing of innocents." Paul Gray, the bassist for the metal band Slipknot, was found dead Monday morning in his Des Moines, Iowa, hotel room, according to police. He was 38. 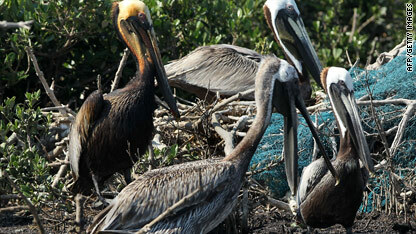 An oil-stained pelican with his cleaner friends Monday. Washington pressures BP: Politicians ramped up their tough talk to BP about capping the massive oil spill estimated to be spewing at least 5,000 barrels of crude a day into the Gulf of Mexico. The Web was afire with the back and forth. The federal government could take over the effort from BP, acknowledged Doug Suttles, BP's chief operating officer. He said the company is as frustrated as everyone else that its numerous attempts to stop the spill have failed. But Louisiana officials told BP that it better move quicker, or else. Gov. Bobby Jindal said the coastline had been "oiled" and he would mobilize state resources soon if the spill isn't capped. The United States and South Korea will conduct both anti-submarine and maritime interdiction training exercises in the future, Pentagon spokesman Bryan Whitman said. A Los Angeles County Superior Court judge on Monday outlined new bail conditions for Lindsay Lohan at a hearing, including a bracelet to detect alcohol, a ban on drinking and random weekly drug testing. The perversity of the NBA playoffs is that success begets pressure. The better you do, the more you need to keep doing it. If you relax, you lose. So writes SI.com's Ian Thomsen of the challenge facing the Boston Celtics, who currently hold a 3-0 lead over the Magic in the Eastern Conference finals. Boston has dominated Orlando over the first three games, reducing the league's most dominant big man, two-time Defensive Player of the Year Dwight Howard, to a non-factor. The Celtics can close the series out tonight at home in Game 4, one of the highlights on a busy sports day (all times Eastern). 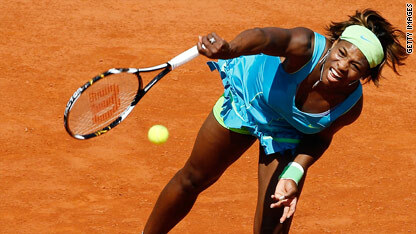 –French Open (5:00 AM-3:00PM, Tennis Channel) Plenty of stars will be on the court at the French Open today including Serena Williams, Jelena Jankovic, Novak Djokovic, Andy Murray and France's own Gail Monfils. Murray meets Frenchman Richard Gasquet in what could be a tricky match for the fourth-seeded Murray. –Canadians at Flyers (7:00 p.m., Versus) Philadelphia can advance to the Stanley Cup finals for the first time since 1997 with a victory in Game 5 at home. –Red Sox at Rays (7:10 p.m., ESPN2) The Rays are the best team in the majors at 32-12, with the league's best start since Seattle won 33 of its first 44 in 2001. Strangely, Tampa Bay has been vulnerable at home (13-7) compared to a remarkable road record (19-5). Wade Davis (4-3, 3.35 ERA) starts for the home team against Boston's Clay Buchholz (5-3, 3.26 ERA). –Magic at Celtics (8:30 p.m., ESPN) The Magic won 59 games during the regular season and its first eight games of the postseason before grinding to a halt against Boston, who are one game away from their second finals appearance in three years. BY THE NUMBERS 46-42 career pitching record of Jose Lima, the former major league pitcher who died Sunday at age 37. 42 Points scored by Suns forward Amare Stoudemire last night in a 118-109 Game 3 win over Los Angeles. The Suns can pull even with the Lakers with a victory at home in Game 4 on Tuesday night. 29 points scored by Stoudemire in the second half. 18 Years between Stanley Cup finals appearances for the Blackhawks. Yesterday, Chicago advanced to the NHL finals with a four-game sweep of San Jose. A Texas death row inmate will get a hearing before the Supreme Court over his claims of "actual innocence" and demands authorities conduct more thorough DNA testing of evidence gathered at the crime scene. At issue is whether capital inmates have a basic federal civil right to have forensic evidence reviewed late in the appeal process. 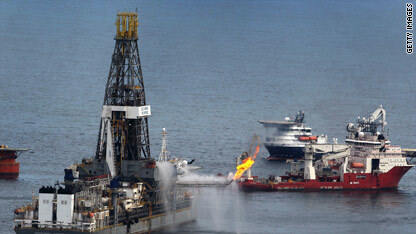 Natural gas siphoned from the oil leak burns off the surface in the Gulf of Mexico. BP to try another option - It's been more than 30 days since oil began spewing into the Gulf of Mexico. BP has failed numerous times to plug the leak caused by an April explosion that sank the Deepwater Horizon rig. Pay attention Wednesday as the company attempts its latest plugging technique. Called a "top kill," the method involves pumping thick, viscous fluid twice the density of water into the site of the leak so the well can then be sealed with cement. Independent scientists told Congress that there could be 10 times the 5,000-barrel-a-day estimate BP and the government have given since April 28. Meanwhile, it's tense between the Obama administration and BP. Homeland Security Secretary Janet Napolitano and Interior Secretary Ken Salazar were Louisiana on Monday to assess whether the company is doing everything it can. Tribal gunmen have kidnapped two American tourists along with their driver and translator, and are demanding the release of their jailed tribesman for the pair, Yemeni officials said Monday. Government sources told CNN they have started moving forces to the area where the kidnapping is believed to have happened near the capital, Sana'a, but that their first option is negotiations. "We will negotiate with the kidnappers to free the tourists first," said an official, who asked not to be named because he is not authorized to talk to the media. Violent crime in the United States decreased 5.5 percent in 2009, the third year in a row that such crime has gone down, the FBI reported Monday. The number of murders dropped 7.2 percent while robberies fell 8.1 percent, the FBI said. The number of forcible rapes went down 3.1 percent while the number of aggravated assaults fell 4.2 percent. Property crime declined 4.9 percent. Police agencies around the country reported crimes to the FBI, which compiled the figures released Monday. The agency did not offer reasons for the drop in crime. [Updated at 10 a.m. ET] Two of three American hikers who have been detained in Iran for nearly 10 months - Shane Bauer and Sarah Shourd - have gotten engaged in prison and plan to get married after their release, their relatives said Monday. 9:30 am ET - Wartime contracting hearing - The Independent Federal Commission on Wartime Contracting in Iraq and Afghanistan holds a hearing on the state of the contracting system. 11:00 am ET - Lohan court hearing - Troubled actress Lindsay Lohan will attend a court hearing in Beverly Hills, California, where a judge will set a date for her probation revocation hearing. Iran has formally notified the U.N. nuclear watchdog agency of its nuclear swap agreement with Turkey, the agency said Monday. President Obama wants to investigate how to prevent future oil spills. To figure that out, this weekend Obama named Graham, pictured, and Reilly to head a new bipartisan National Commission on the BP Deepwater Horizon Oil Spill and Offshore Drilling. Graham was Florida's governor for two terms, followed by 18 years as a U.S. senator. 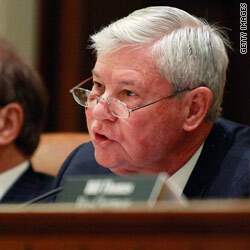 Since retiring from the Senate in January 2005, he has served on several federal panels, including as chairman of the Commission on the Prevention of Weapons of Mass Destruction Proliferation and Terrorism. Reilly was EPA chief in President George H.W. Bush's administration from 1989-93 and is chairman emeritus of the board of the World Wildlife Fund. Iran's intelligence minister said Sunday that three Americans arrested there in July are spies, but hinted the country may consider releasing them in exchange for the release of Irani prisoners, state media reported. "It is clear that the three Americans are spies," he said, according to a report on Iranian state TV's website. Shane Bauer, 27, Sarah Shourd, 31, and Josh Fattal, 27, were detained in July. Their families say the three accidentally strayed across an unmarked border while on a hiking trip in Iraqi Kurdistan. A brush fire in Corrales, New Mexico, forced a few hundred people to evacuate their homes late Sunday night, police said.